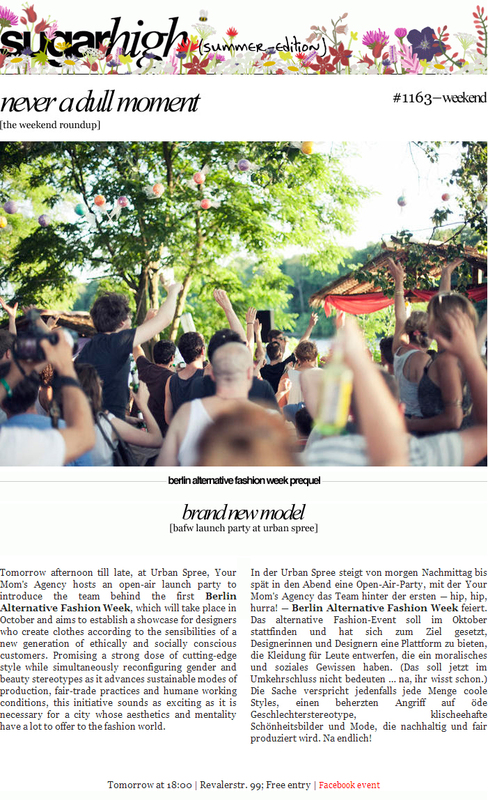 Berlin’s fashion calendar has to count with a new addition to its schedule! The first week of October will see the inception of the first Berlin Alternative Fashion Week, a platform showcasing the rise of alternative concepts in fashion. The team behind the new event aims at promoting new and established off the grid innovators, in a move away from the big name dominated traditional fashion week, while also focusing on the major but often bypassed ethical, ecological and social aspects linked to the fashion industry. Berlin Alternative Fashion Week will consist in a week-long program of shows, talks, markets and parties in some of Berlin’s most interesting venues including brand new spaces Neu West Berlin and Ewerk. Confirmed designers already include a string of hot names from Berlin and beyond such as Maartje Dijkstra, Tata Christiane, Tzuji, Jylle Navarro, Lady Gonzalez, Leo Carlton, Eugenia Alejos and Alles. The website of the event will also showcase interviews, editorials, and fashion shoots from exciting emerging talents with Your Mom’s contributing a series of pictures by Francesco Cascavilla with some of Berlin’s best underground musical talents wearing clothes by Tata Christiane, Sing Blackbird, Paul’s boutique, Anto Christ, a.d. Deertz, Juliane König, Muschi Kreuzberg, Sooph, Juan Chamié at Exit, UY and Carla Caminati. Models featured included Marcel Schlutt (editor in chief of Kaltblut Magazine), Stimulus, model Matthew Robinson, Joeva Lemieuvre (Fashion blogger on La Fashion War), musician and Cómeme affiliate Rroxymore, Journalist and Popmonitor editor Friedrich Reip, Leonizer Records family-member La Fraîcheur, Naked But Safe editor in chief Otis Chatzistefanou, part-time experimental robot and full-time genius selector Andreas Krach, Trapped In Berlin party organizer Charlotte Roux, dark-pop songstress Ciguri, French techno-pop maestro Electrosexual and performance artist and Hyenaz band-member Mad Kate. The Alternative Fashion Week will officially launch on friday July 25th at Urban Spree and Your Mom’s will be providing the musical decorum with Alex Montolio, Carne, Das She Cray and Andreas Krach spinning fresh alternative slices of Disco, Hip-Hop, Funk and House to see the crowd through the afternoon and into the sunset. 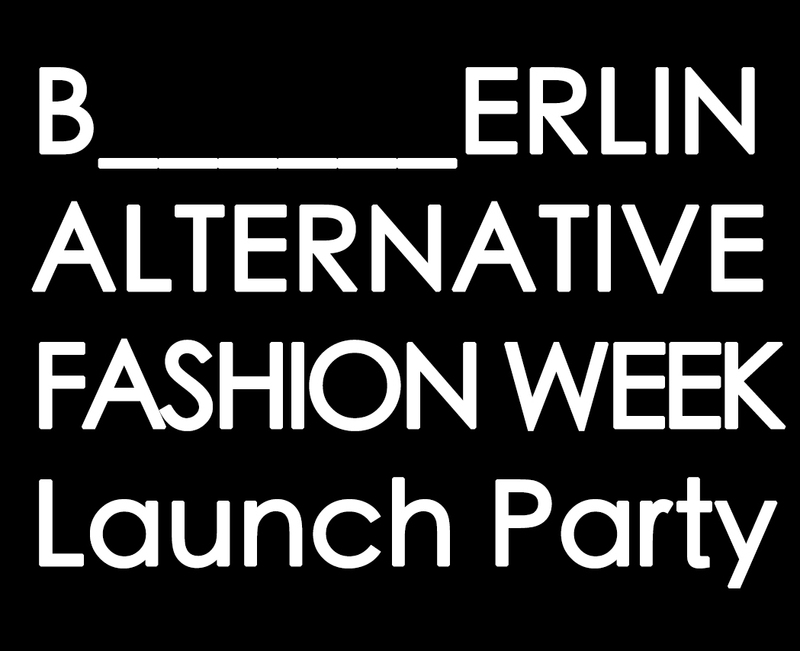 Stay tuned for more events following to the Berlin Alternative Fashion Week, including a Designers market at Neu West Berlin on Saturday August 16th in collaboration with Berlin Pieces/Berlin Dress. For more information and to apply for a booth head to the event page. Read more about the launch party on Sugarhigh, I Heart Berlin, Kaltblut, OE Magazine, Urban Spree, The Club Map, The Luxury Lifestyle Daily and read more about the Designers market on Sugarhigh, Reberllin and Ontai.